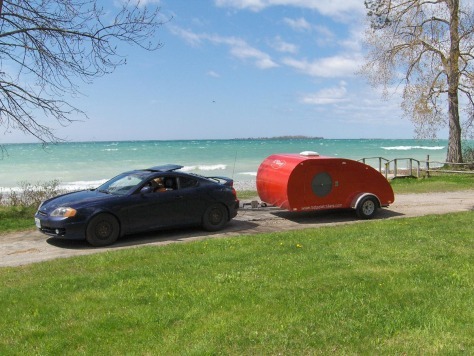 Our T@B trailer has changed our outlook on life. 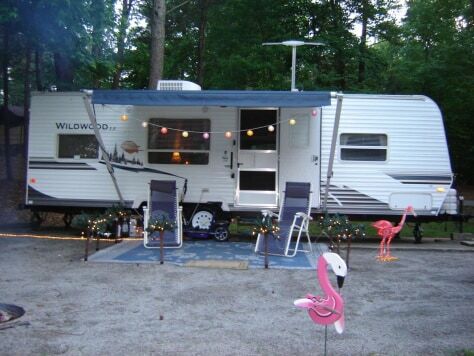 no RV or Camper is complete without your Pink Flamingo's, Last summer we sent 16 weeks in the camper, It's a great Life !!!!!! 2005 Aliner LXE, folding hard sided camper trailer - no canvas! 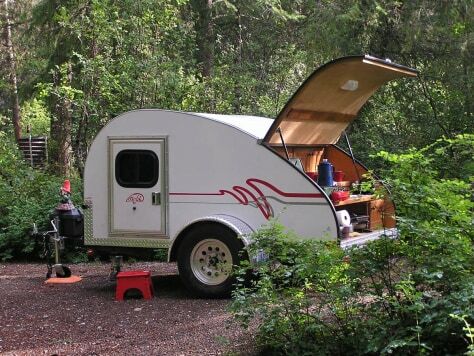 This small camper contains a full queen sized bed that pivots to reveal substantial storage underneath. It also has heating and air conditioning, LED and fluorescent lighting, a kitchen with three burner stove, microwave and refrigerator with freezer, and a bath with flush toilet and a full shower with hot water. This camper can go "off grid" for weeks, thanks to a portable battery unit that supplies power when there's no electricity available, and recharges while we drive. I love it because we can get together with our friends and spend some great quality time with our kids! 7000 feet up in the Colorado Rockies with my antique railroad caboose and beautiful Mt. 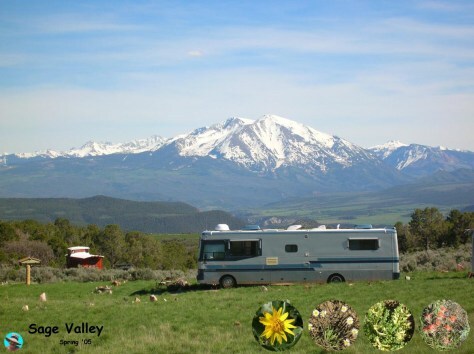 Sopris in the background and a little sprinkle of spring wildflowers. THIS IS THE INSIDE OF WHAT MY HUSBAND CALLS " MY BIG GIRL PLAYHOUSE" I LOVE THIS TRAILER !!! YOU CAN BE SOMEWHERE ELSE JUST BY ENTERING IT. ITS PEACEFUL AND I'M SURROUNDED BY ROMANCE AND TRANQUILITY . 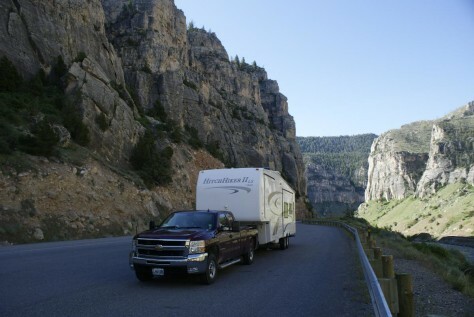 My Chevy Duramax towing my 06 Hitchhiker IILS in the wind river canyon of Wyoming. We gave away, sold, or placed all of our belongings into storage. 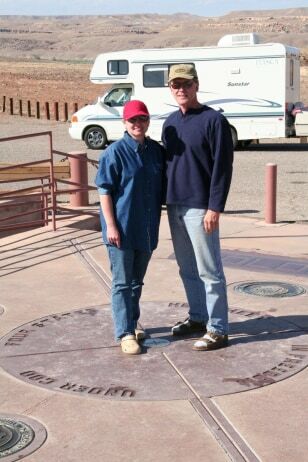 On January 12th, 2007 we left our home in Colorado Springs, CO and started driving south. Photo: Mango with Chad, Ana, and Pikes Peak in the background, Colorado Springs, CO. 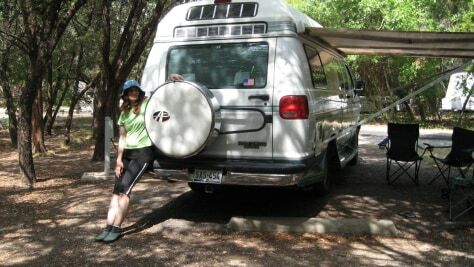 I call my RV Howie (Home On Wheels Is Excellent!). He provides food, transportation and lodging when I need it and he is so beautiful to look at! I AM in love! 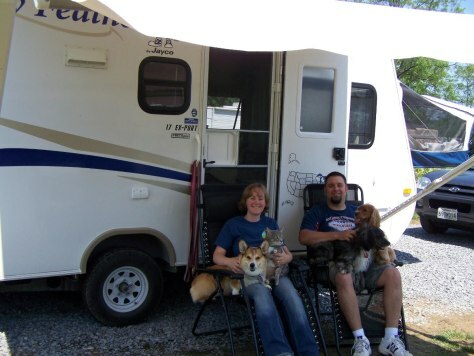 We love our "Lil Kamper" because it allows us to take along our furry family wherever we go. 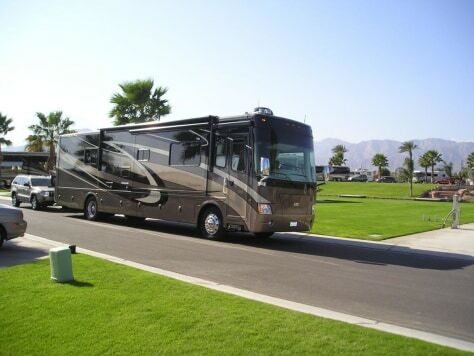 We have all the comforts of home while traveling from one relaxing spot to the next! 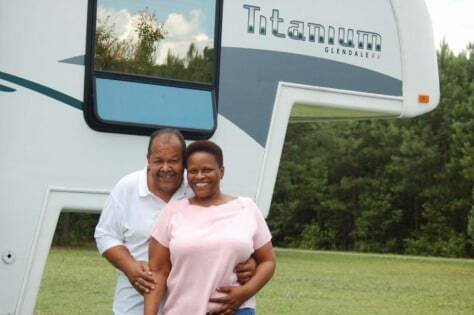 Our Motor Home give us a chance to get away and spend quality time together. 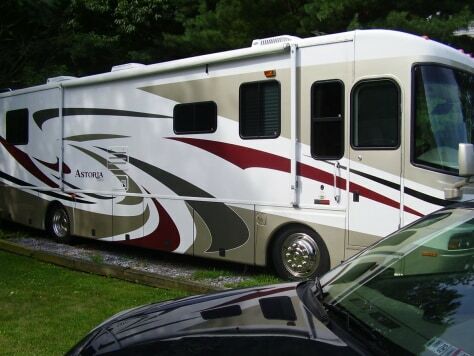 My wife and I like going to the NHRA drag races in NJ and with our RV we can go to the races, stay right at the track, and save money. We don't have to buy food at the track or spend money on motels. 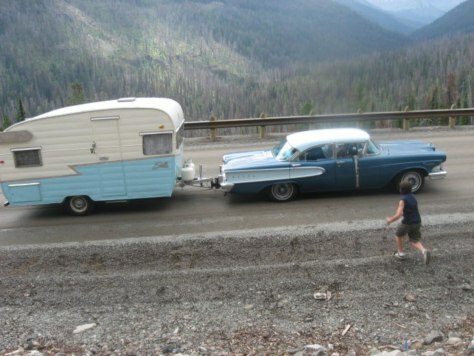 Once a month we try to go camping with family and friends just to get away. I am self employeed and we have not been able to take a vacation in years, so our vacation is the few weekend we get to spend camping and making day trips to beaches and parks. 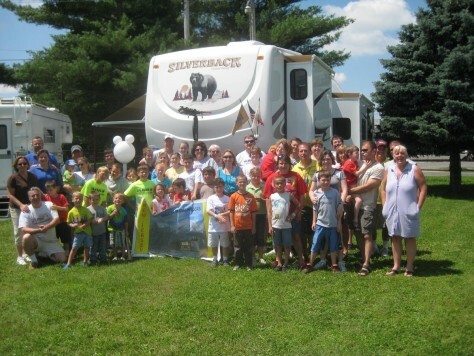 We love visiting different camp grounds and meeting people. Traveling is an adventure. 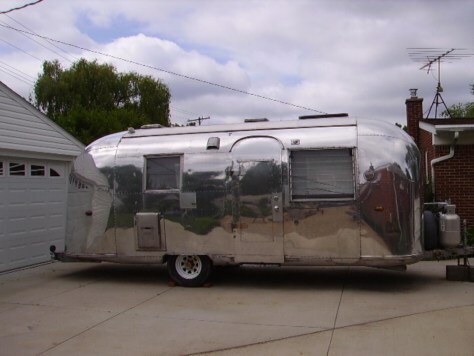 To travel in an RV, an Airstream RV is an adventure with the pleasures of a ''home on wheels''. 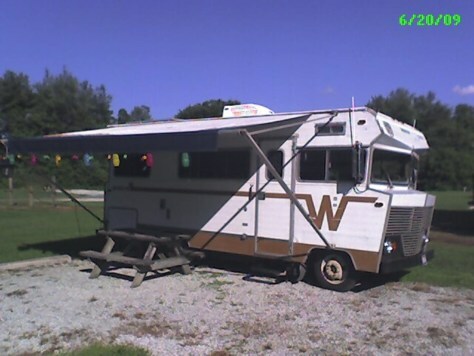 My 1972 Winnebago Brave. 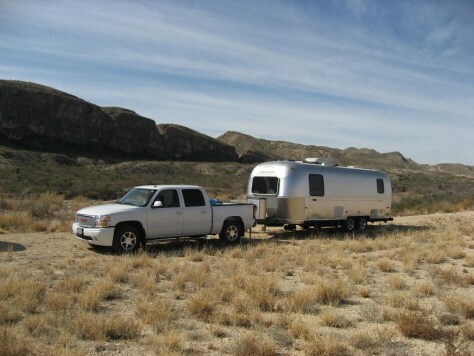 I can't imagine exploring our land in nothing other than a Classic Winnebago that was made right here in our own back yard by hard working American people. Something that is getting harder and harder to find, made in the USA, with pride! 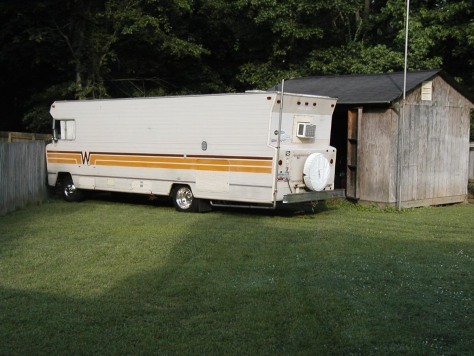 My son and I take our camper to the Nascar races, weekend get aways, or we just park it in the backyard and camp there. Especially when gas is $4! She's an oldie, but a goodie! Has never let me down in the 16 + yrs that I have owned her! This set up served as my lifeboat after loosing my job at the St. Louis Minivan plant. Lived in it for three months while moving to Indiana. Now instead of using it for vacations I use it to visit family in Missouri. Feels weird vacationing in my home town. 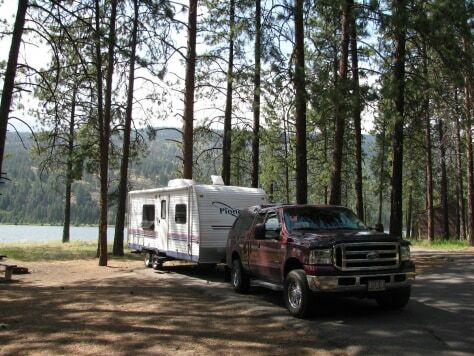 Our 38', 2008 Meridian is, literaly a home away from home, and let's us take our car with us. 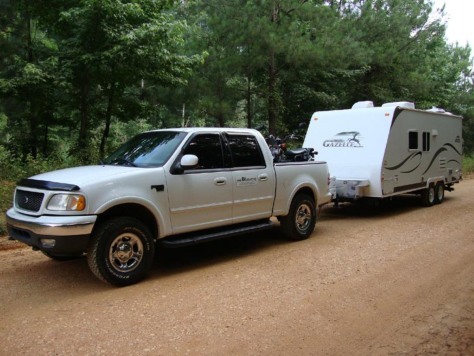 Our trip to Tunica, Mississippi, in 2008, was our first major cross-country trip, and our "shake-down". There is a wheelchair platform-lift inside the large square door behind the front entrance. We have a 2001 Safari TREK. Bought it new and just love being able to get out when we can. Just wish we had more time. Our 2005 VW Sunstar gets 16 MPG. 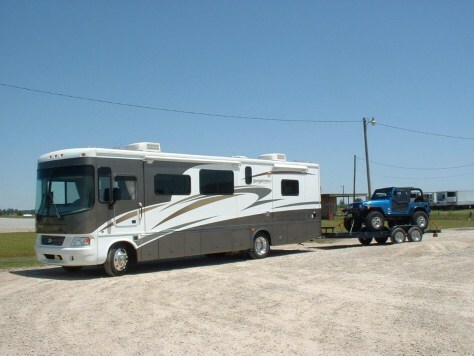 Hauled two of us and a great 65 pound dog over 12,000 miles last winter! 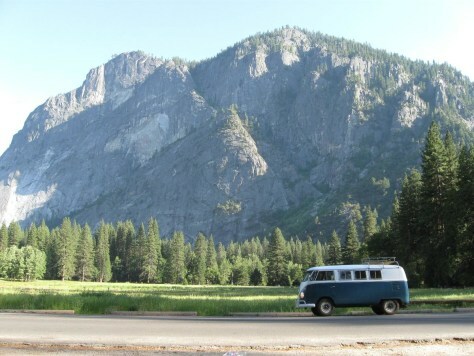 We have everything we need in that RV and love the freedom it gives to go and explore. 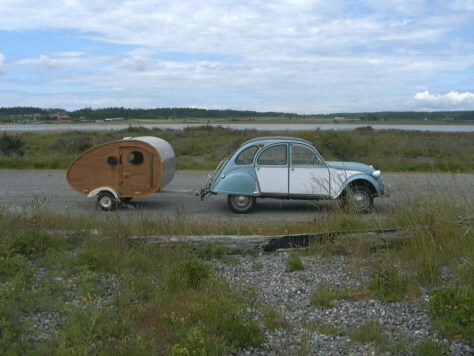 Its small enough to be inconspicuous in some spots and big enough to live out of for 75 days.... Not too mention that its a Volkswagon and holds its resale vaule quite well. This is my 1970 Starchief that I renovated this past year. I love my little get a way even when it's parked in the yard especially when it's time to be by myself. I recommend to anyone needing an inexpensive way to treat yourself to a night away from home, to try this idea. It works for me!!! 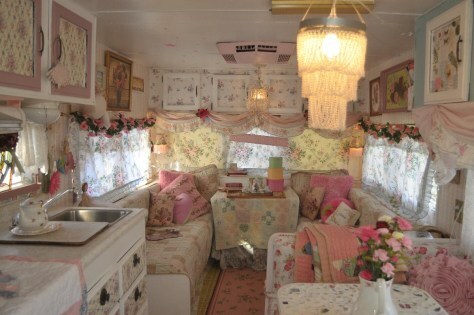 I feel like I am living in the past when I enter into my rv. 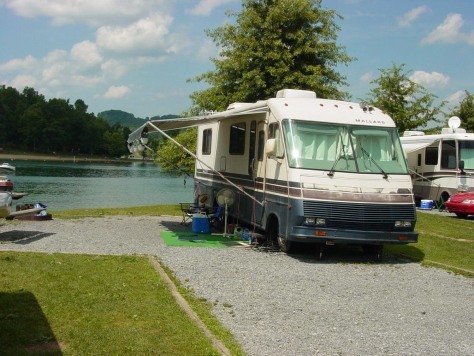 This RV gives us the opportunity to take our large family and have lakeside living at an affordable price. Even our teenagers love to stay in it. It is a vehicle to keep our family close. 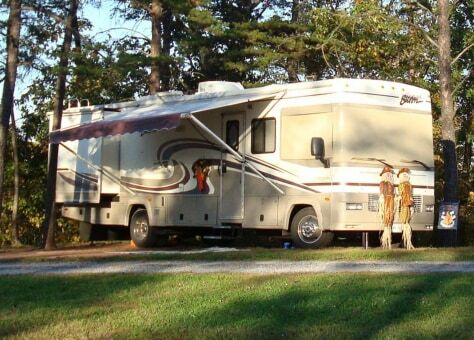 Our family has traveled to forty states and ten National Parks with our RV. 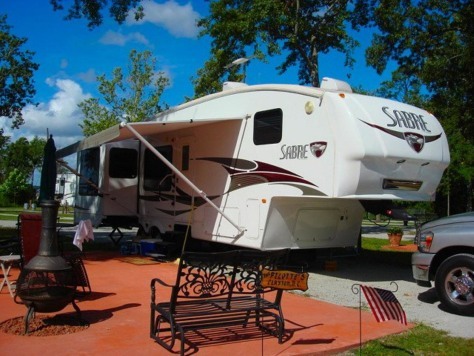 We absolutely love being able to bring along with us the many comforts of home. 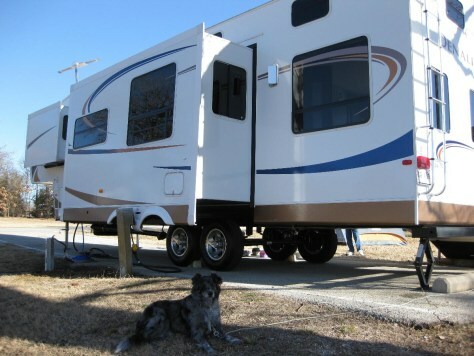 We travel with two adults, two Boxer dogs, a cat and our thirteen year old daughter and our trailer has plenty of room and storage space to stow away all of the necessities for each of us. Owning our RV has made it possible for us to travel to many of the most beautiful places in America and the memories we have made and are continuing to make are priceless. We can't wait to get "on the road again" very soon. It's paid for! 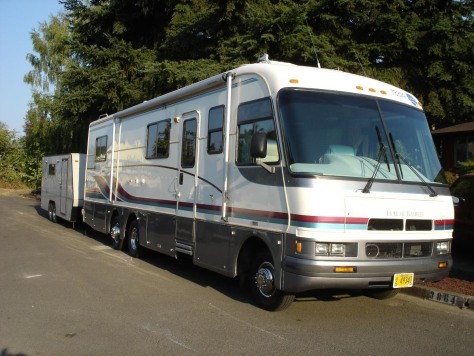 Alot of older RV's are great deals especially for the part timer who only takes short weekend trips usually within a couple of hours of where I live. I don't need dual tip outs. I need dependability and affordability and an air conditioned bed. 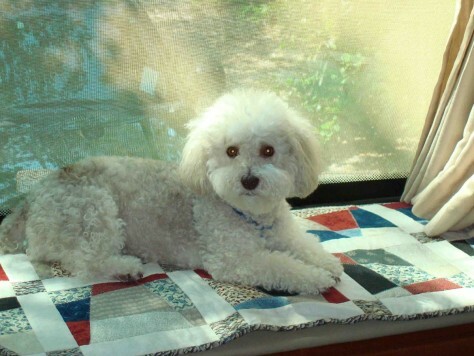 We love our RV because it lets our dog, Daisy, travel with us. This photo shows her relaxing on the dashboard of our Allegro Bus. 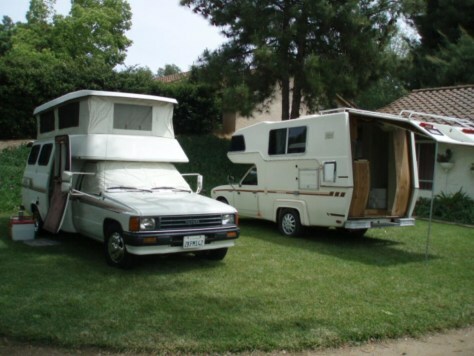 Another real benefit of the RV lifestyle is that it allows you to visit America and sleep in your own bed. And, perhaps best of all, is that we have met so many really interesting and good people in the campgrounds! 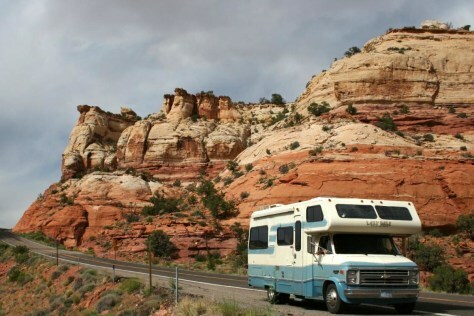 If you're feeling down about the state of the country, we suggest you get an RV and use it. It will remind you that this is a great country full of wonderful people. 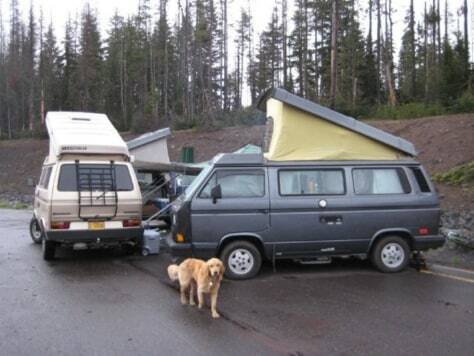 Typical RV campground. We visit new places and see new things. 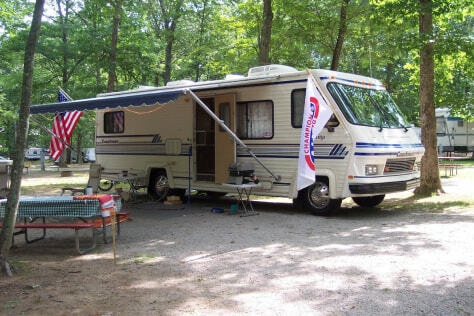 This campground is in New Bern, NC, home of Pepsi. We walked around their historic down town visiting neat boutiques, antique shops, and restaurants. This 2 y/o r.v. of ours for our "dream" is no longer a dream. We can't afford to run the darned thing with the diesel costs and insurance. It has been sitting in our driveway and keeping us in debt. 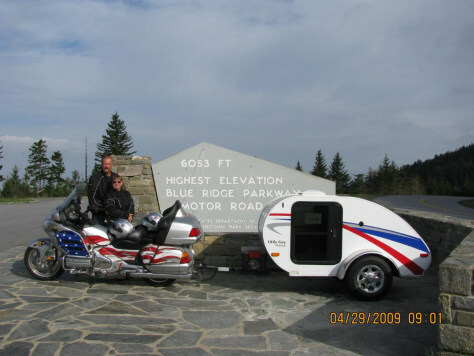 There are so many beautiful sights to see in the United States and traveling in our Trek motorhome allows us to see the country. When we get bored in one area we just turn on the motor and head on down the road! 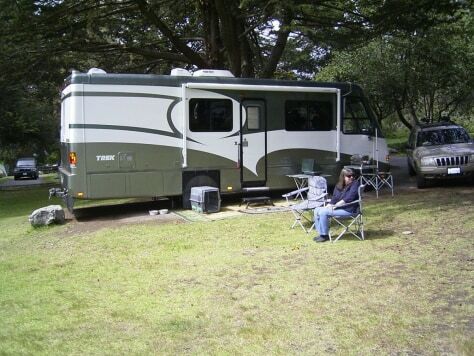 The Trek is a very comfortable way to travel and offers a large living area for a small motorhome. 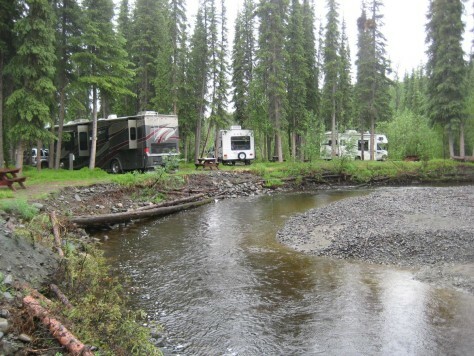 My RV allows my wife and I to live in these kinds of surroundings near Glenallen, Alaska. 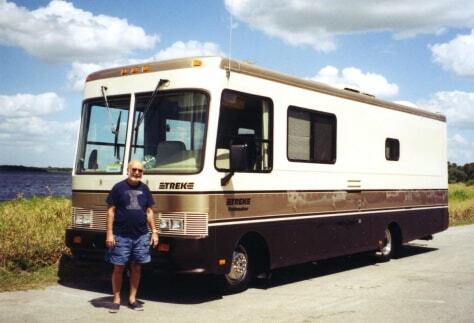 Since retirement, we have lived full time in our RV. There is nothing like some quiet time by the lake with your family. The memories last a life time! 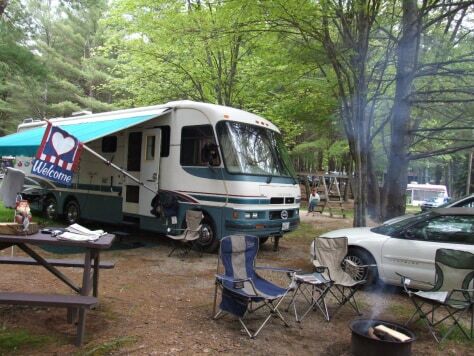 We love to take our 93 Holiday Rambler to Scotts cove in Maine by Lake Bunganut. 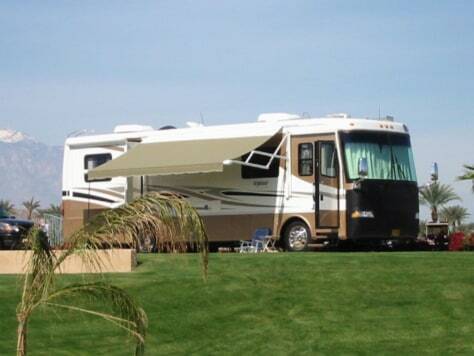 2008 Palomino Gazelle G210 Travel Trailer. We plan to live in it full time starting in 2010. 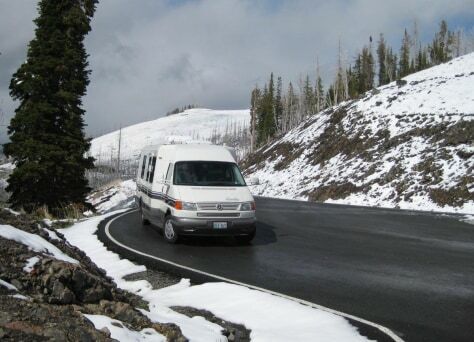 Visit http://RVroadtrip.us for more info. Love my 04 Fleetwood 19Ft Pioneer. I have driven from Anchorage, Alaska down to Montana, have toured all of the NW with it and I can't wait to get going again. 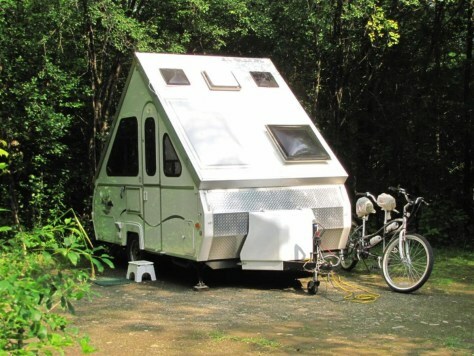 The smaller size makes a lot more campground sites accessible and I like being able to unhitch if I want to stay somewhere for a longer time. The Manor, and the Guest House. In the winter the big bus is my parents condo in Florida. In the summer My brother and I share it to camp all over the midwest. 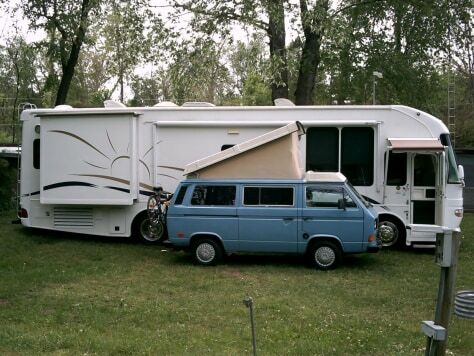 For short trips or larger gatherings I bring out the classic VW Westfalia with pop top roof, 2 double beds, fridge, sink, stove almost all the comforts of home. 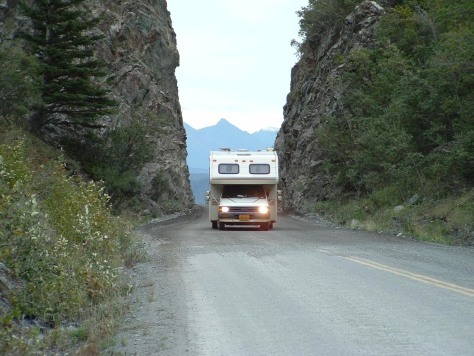 We adore our motorhome because it takes us on the road to many exciting adventures when we want and where ever we want to go. 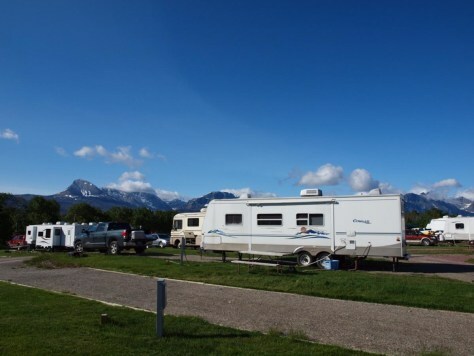 It is comfortable and spacious enough for the two of us and one dog and yet small enough to get us into some of the most beautiful campsites with fantastic views. 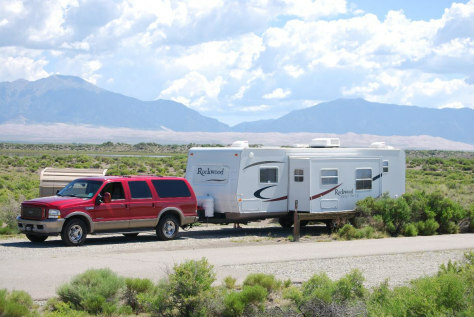 We love the freedom that our RV affords us. Our VW Rialta is economical on gas, and is just the right size for the two of us. 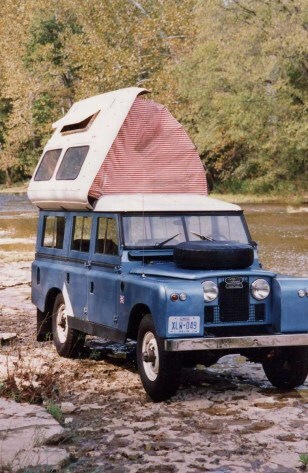 Just finished building NAPSACK in June....it's got everything I need for the road including the kitchen sink! 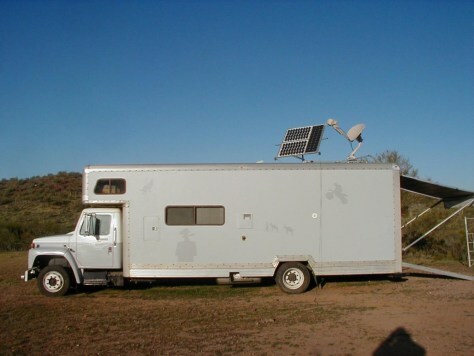 MyHaul HomeBrew-Huge capacities, separate garage, gimbal mounted refrigerator, attic with full house ventalation, solar, satellite TV, satelliteinternet, satellite phone. Designed and constructed by an experienced fulltimer. 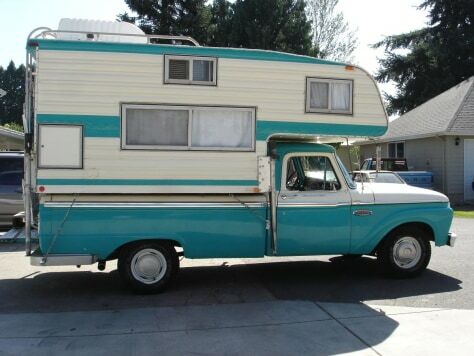 1972 Boler. 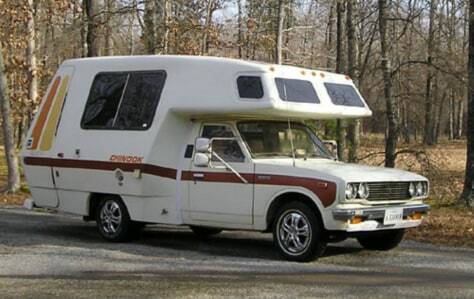 this light weight camper was made for a small car to tow behind it. they are made of fiberglass and very light weight. my wife and I try to go camping as much as we can on weekends. we try to go to different Texas State parks every time we go. camping is avery relaxing time and not expensive to do. 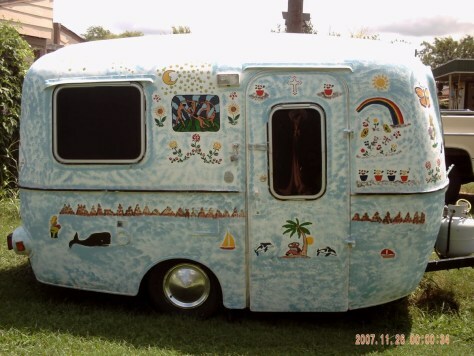 my wife and I painted our camper and we have had alot of people stop us to enjoy the art work. 38 mpg allows us to see the entire country on a reasonable budget. Just love to travel this way. Circle the Vanagons. 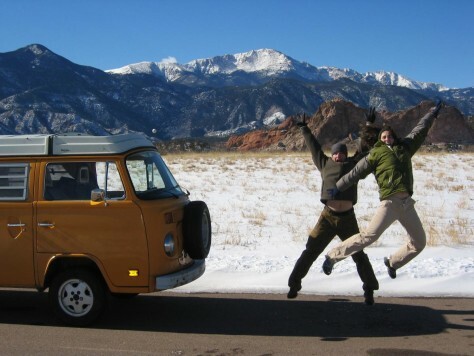 Our grey Westfalia allows us freedom to camp almost every weekend. Photo is at Mt. Hoodoo in Oregon. 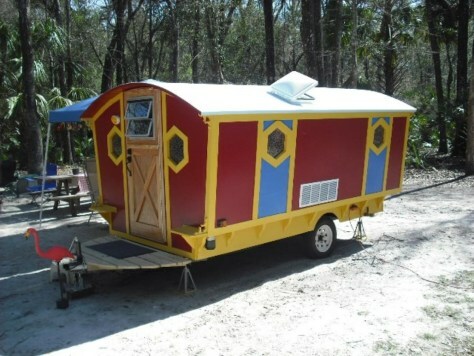 I built this camper we call the "Little Gypsy". So far we have camped at several state parks in Florida. It is small enough to pull behind a 4 cylinder, yet roomy enough for a full size bed and a full galley. 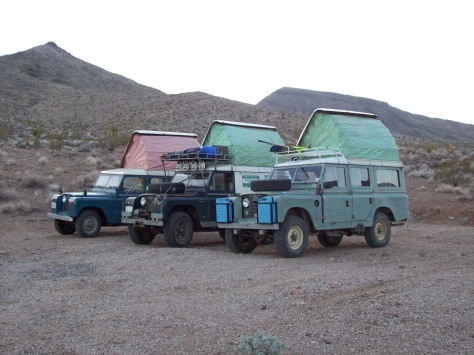 My friends and I with our 1960s vintage Land Rovers with the factory-authorized Dormobile camper conversions. 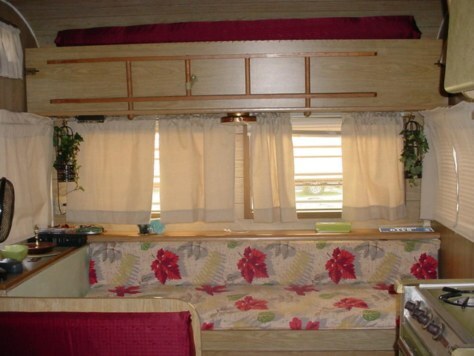 The seats all fold flat to make a double bed, and there are two bunks that fold out up top, allowing them to sleep 4. This, combined with Land Rover's go-anywhere capability, make the perfect vehicle for exploring the remote areas we love. This photo was taken on the historic Mojave Wagon Road in California. It's just the right size !!! 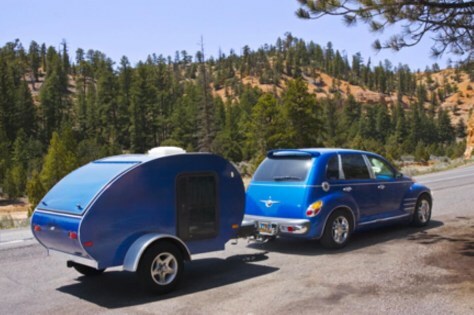 While my wife prefers our 18 ft. travel trailer, my favorite way of weekend or week-long rving is "PTCruisin" with our "little guy" teardrop trailer and an EZup canopy/tent large enough to park the trailer in if needed. Great gas mileage and a great conversation starter. 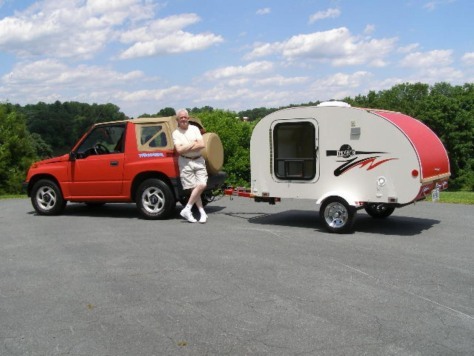 Tadpole Teardrop Trailers - At only 800 lbs. you can pull it with a compact 4 cylinder car! I love my car. 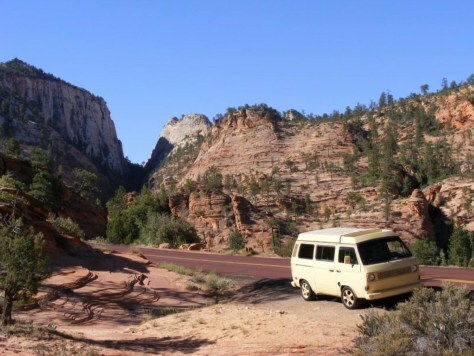 It's a 1965 Volkswagen Transporter Riviera Camper. I drive it every day and regularly take it on camping trips half way across the country. Just got back from camping in the Rockies four hours ago. 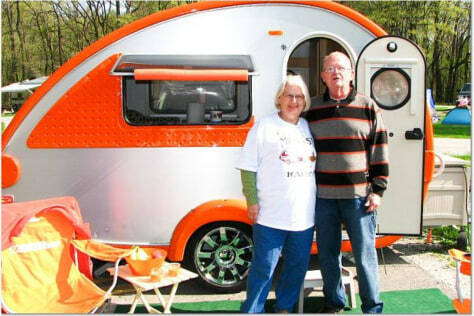 A place to sleep, a kitchen with a sink and we are home in the great outdoors with our Teardrop trailer. 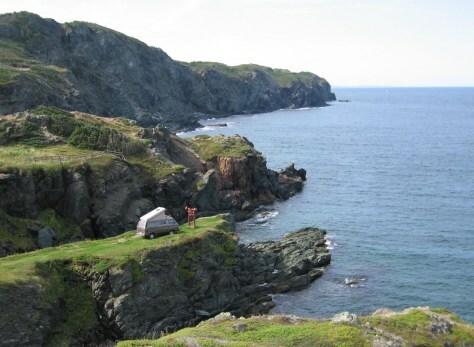 VW Syncro Westfalia, camping in Twillingate, Newfoundland....felt like we were on the edge of the world. Indio, California. With our cat and dog and home cooked food prepared and frozen before we hit the road, we enjoy spending warm winter months away from Oregon's wet, cold, snowy, and icy, winters in places like Indio, California as seen here. Our 2005, 35 foot, diesel powered, Holiday Rambler Neptune motor home is a modest and economical way to enjoy the freedom of spending three months on the road visiting places like Malibu, Newport Beach, Indio, California, Sun City, Arizona and Las Vegas, Nevada before heading north to enjoy Oregon’s spring, summer and fall. 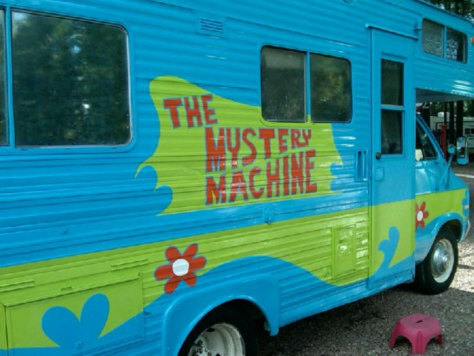 I love our Mystery Machine!!! 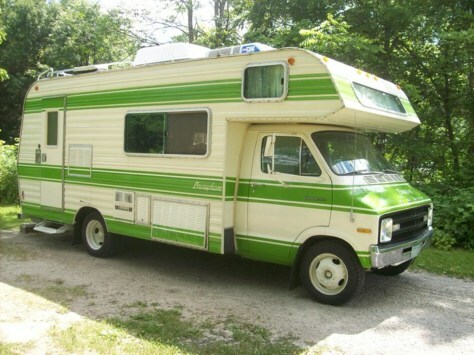 We had the old RV painted to breathe new life into it. The kids love it, we love it and it's quite the conversation piece! We constantly get stopped for picture taking and we even have a personalized plate - Jinkeez! 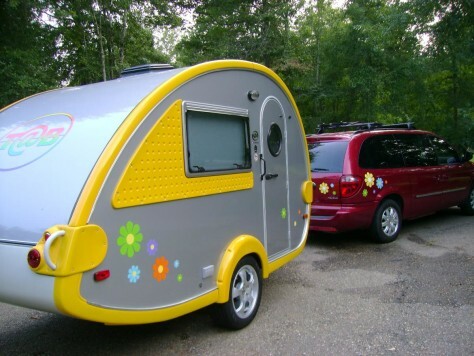 Talk about making camping fun for the whole family.